For our crit my pic feature this week we’re going to be looking at an analogue film street photo that was shot by Nathanaël Fournier. 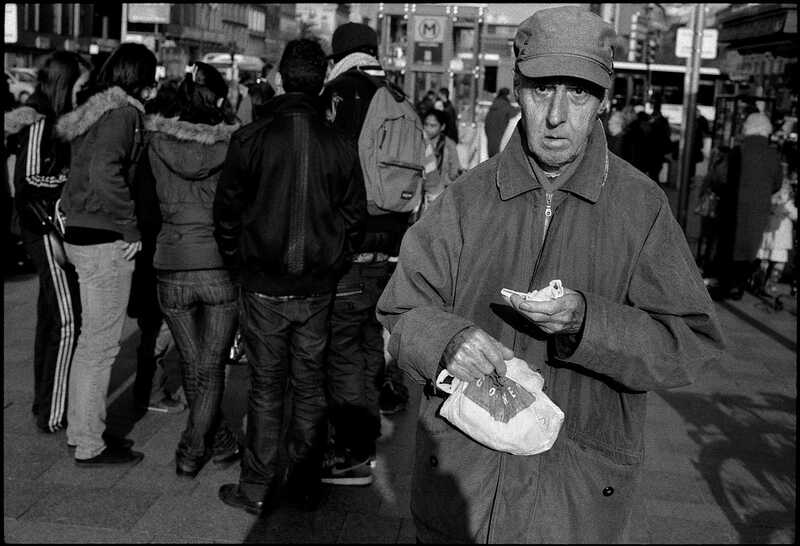 The photo is titled ‘Wilson Square’ and is part of his “Everyday’s Life Value” series. As usual for this feature, I’ll be analysing this photo across the criteria of point of view, focal point, composition, exposure, subject matter, and mood. I still have quite a backlog of photos to be working through, so, I’m going to ask that you don’t send in any new photos for the time being until I’ve had a chance to catch up a little. That concludes our introduction, so now we can get into the really meaty stuff – the crit of ‘Wilson Square’ by Nathanaël Fournier! I like the point of view of ‘Wilson Square’ as I find it quite immersive. While I expect it was probably shot from around head height, the fact it was made whilst Nathanaël faced head on towards his subject as they walked towards him gives it instant impact which is always beneficial in a street photo. The point of view allows the subject to loom quite large in the frame and also make direct eye contact with us as viewers which further encourages and sustains our engagement. So, in this case, the fact that the point of view depicts our standard view when we’re walking down the street easily allows us to instantly immerse ourselves in the scene – it feels very ‘point of view’ like, and seems like we ourselves are the photographer. Nice one! Nathanaël has clearly identified his focal point in ‘Wilson Square’. It is quite clearly the man in the cap! As I’ve mentioned above, the man appears quite large in the frame, dominating almost one half of it and occupying the entire vertical area of the shot. Not only that, but he is also the only person in the frame that we can see head on, and the only one whose face we can see too. The fact we can look directly into his eyes also draws and captivates our attention. The only other objects that vie for our attention in ‘Wilson Square’ are the cluster of people in the left of the frame. But, as they are facing away from the camera they play very much a secondary role in the photo. It could be argued that they are a little distracting as they make up such a large ‘mass’ so close to our subject, however I think that this is a conscious decision on Nathanaël’s part (as I will explain later) so I won’t criticise it for the time being. 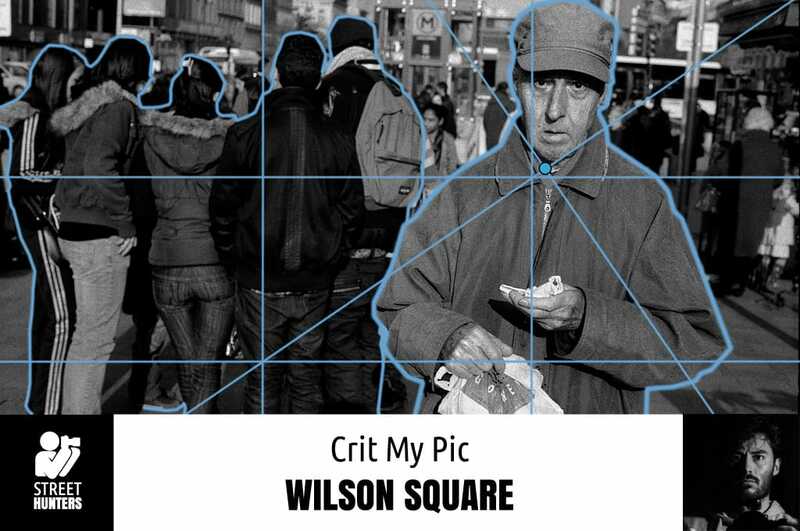 In terms of composition, ‘Wilson Square’ demonstrates some strong understanding of good compositional skills. As I’ve stated, the main focal point (the man) roughly occupies one half of the frame. However, as you can quite clearly see, Nathanaël has made a conscious decision to place him well off the centre of the frame so that his head roughly appears in the upper third and second third vertical area of the frame. This creates an imbalance of visual ‘mass’ in the shot which as we know makes a shot more arresting and visually appealing. If we add in some lines for a golden ratio point, we can see that this sits around the point of the man’s chin. Again, this is a good thing for the composition. I’ve mentioned in several previous crit my pic features that we are naturally drawn towards human faces in photos. So, what benefit comes from having the man’s face around the golden ratio point? It is the area of the frame our eyes are naturally going to gravitate towards and spend the most time in – so if it coincides with a region that creates the best artistic ‘balance’ in the shot then all the better! The other key compositional element we need to discuss in ‘Wilson Square’ is the huddle of people to the left of the frame. It is very clearly the only other element of the shot that calls for real attention. This is because this circle of people creates a heavy ‘mass’ of negative space in what would otherwise be an empty portion of the frame, and offsets the man a little. I like that there is an object in this part of the frame as it gives it more of a story, and Nathanaël is off to a good start as perspective naturally makes the group appear smaller than the man and places them on a different level to him. However, to my eyes, they still appear a slightly distracting presence. They occupy just a little too much visual bulk in the frame, and stand too close to the man in the hat. If Nathanaël had been able to wait a little longer until the man had walked further away from the group – so the group appeared smaller and there had been a little gap in the centre of the frame between the group and the man, or if the group itself had been comprised of fewer people, I think it would have proved less distracting. ‘Wilson Square’ is an analogue photo, shot on film, and exhibits the lovely textured grain effect and dynamic range common with the medium. Judging by the shadows, the light source (the sun) was behind Nathanaël when he made this shot, as it nicely illuminates the face of the man walking towards the camera. I can also see a long shadow in the centre of the frame which I suspect could be Nathanaël too! I don’t know what speed film Nathanaël was using, but I wonder if it was a little on the slower side as I can see a fairly pronounced fall off in the depth of field between the man and the group of people, and more so with the very background of the shot. This isn’t necessarily a negative, as is in terms of the background it creates a nice blur which also prevents the background from being too distracting. I might say that ideally the exposure could have been raised a little, either throughout the frame or by just dodging to lighten the man’s face and body just so he stood out a little more in the shot. However, Nathanaël may have stylistically opted to keep things darker (more on that later). Our subject matter in ‘Wilson Square’ is fairly typical for street photography – a man walking down a busy street. However, the fact we can see so much of the man and also make ‘direct’ eye contact with him allows us to infer some more from our subject matter. The man looks quite focused, like he’s certainly got something on his mind, and almost a little concerned. When we begin to think about the group of people on the left of the frame, things begin to take on a different dynamic. Are we seeing the contrast in lifestyles between the younger generation and an older one? Between a group of friends and someone on their own? We can’t be sure. But this dichotomy does lend an interesting aspect to the photo and allows us to begin thinking more deeply about our subject and what his possible story might be, and this is always something sought after in a street photo. If we continue on the theme of the points raised by the subject matter, we might like to speculate that the prevailing mood of ‘Wilson Square’ is loneliness or detachment. This would fit with the monochrome film stock and general greyness of the whole photo – with the exposure and colour (or lack of) helping to add to the mood of the subject matter. Of course this is all speculation, but I definitely get the impression that the mood Nathanaël sought here was veering more towards the negative than the positive, especially given this photo was part of a larger project about the values of everyday life. Overall, ‘Wilson Square’ is a good photo. I’m delighted to see it includes a clearly identifiable subject who has been placed well in the frame and has been shot in an in-your-face way that shows not only bravery on Nathanaël’s part, but also allows us as viewers to begin to engage with the subject on a personal level. And that is by far the strongest and most powerful aspect of the shot. Viewed in isolation, I wouldn’t say that it is a photo with enough punch or sheer visual drama or impact to leave a hugely lasting impression, but when viewed in its role as part of a series it begins to make a lot more sense. Ideally I’d like to see some more drama injected somewhere – perhaps with stronger lighting, or by isolating the man more from his background and that group of people by getting closer to him or by giving him an even bigger presence in the frame. So, ‘Wilson Square’ definitely earns its place in Nathanaël’s series, but I’d like to see some shots which are a bit more abstract and arty leading the line and hogging the limelight of the project! Free eBook from PhotoWhoa - The Street Collective Vol.1! Digby, I’m new at this site and I love the content and “critic my pic” session is priceless. In my point of view the background could be out of focus to create a mood of mistery and empowers 3d. Ok, but I was not there. Great pic Nathanael. Digby, when I can sent my images? Hi Fiori! Thank you so much for commenting, and delighted to hear you enjoy the feature. I must get back down to analysing the collection of street photos that are waiting for me in the folder. Once I’ve worked my way through the set a bit I’ll change the intro for the relevant post to explain that we need more photos again. Enjoy your shooting, and welcome to the site! !